On 9th August 2011, Manchester became the latest in a number of major UK cities to be rocked by the violence of rioting and looting. With support from the youth engagement charity RECLAIM, enJOY arts has secured funding from the High Sheriff’s Police Trust for a performance project which allows young people from urban areas the opportunity to ‘ReACT’ to these disturbing events and present their own creative response to the riots. Over two weekends in November, the young people have come together to devise an innovative performance which considers causes, consequences and positive ways to move forward. 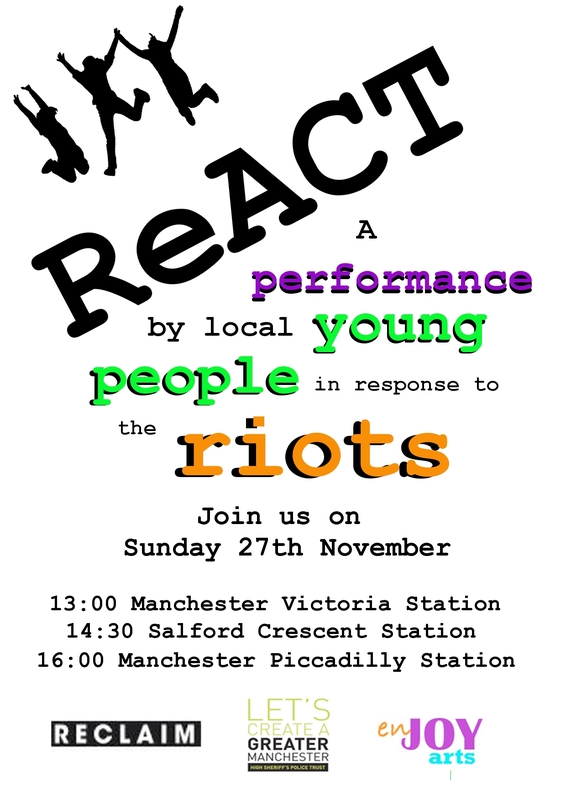 This performance fuses drama, movement and music and will be performed at train stations across Manchester and Salford on the afternoon of Sunday 27th November (exact times and locations detailed on the flyer above). By performing in busy public places, we hope that this performance will reach a wide variety of people and help to encourage their own ‘ReACT-ion’ to this important issue. This entry was posted in News and tagged community, enJOY arts, high sheriff's police trust, manchester, northern rail, performance, piccadilly, reclaim, riots, salford, train stations, victoria, young people, youth by enjoyarts. Bookmark the permalink.